On September 28, 2018, the Department of Defense and Labor, Health and Human Services, and Education Appropriations Act, 2019 and Continuing Appropriations Act, 2019 was signed into law. The law includes an NIGMS budget of $2,872,780,000 for Fiscal Year (FY) 2019—a 3.1% increase from FY 2018. This budget increase follows a 5.1% rise in funding in FY 2018. NIGMS is committed to ensuring that taxpayers get the best possible returns on their investments in fundamental biomedical research [PDF, 702KB] . As part of this commitment to stewardship [PDF, 7.89MB], we regularly monitor trends in our funding portfolio. As we work on issuing a new funding opportunity announcement (FOA) for the established investigator (EI) MIRA program, we thought it would be useful to address a few common questions we’ve been hearing. The new FOA will allow applications from NIGMS grantees who have one or more single-Principal Investigator (PI) R01-equivalent awards, just as the current FOA does. In addition, the new FOA (to be published by Fall 2019) will allow renewal applications from PIs who already have MIRA grants. NIGMS has made MIRA awards to Established Investigators (EI) and Early-Stage Investigators (ESI) for three full Fiscal Years (FY). In this Feedback Loop post, we provide an analysis of application, review, funding, and demographic trends for the MIRA program. For the first two rounds of EI MIRAs, eligibility was limited to well-funded NIGMS investigators: PIs with two or more NIGMS R01-equivalent awards or one NIGMS R01-equivalent award for >$400,000 in direct costs. For the FY 2018 EI competition and beyond, eligibility was expanded to include any investigator with a single PD/PI NIGMS R01-equivalent that is up for renewal. For the FY 2016 ESI MIRA competition, ESIs and New Investigators (NI) at the assistant professor or equivalent level were eligible, whereas eligibility was restricted to ESIs in subsequent rounds. As always, a PI can apply for an extension of ESI status for various life and career events, including childbirth. Since supplemental grant funding comes in a variety of flavors, with different purposes, it’s not surprising that there’s confusion about which kinds of supplements MIRA grantees may apply for and which they may not. Here’s a quick run-down. 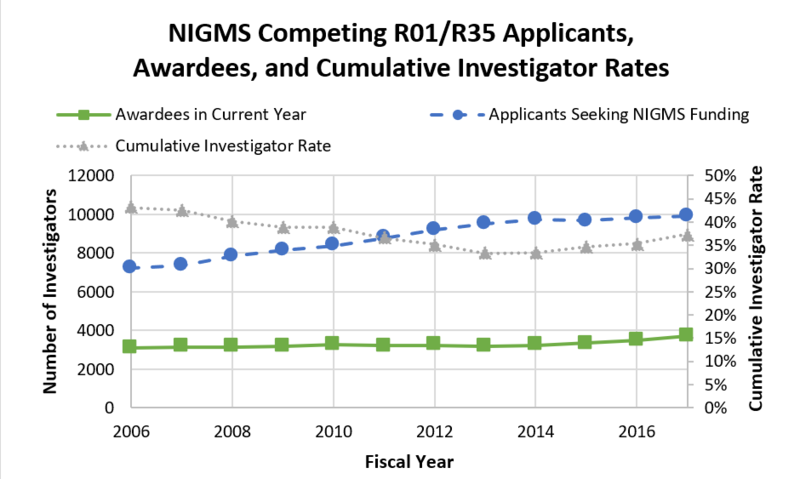 When NIGMS issued PAR-17-094, Maximizing Investigators’ Research Award (R35), in December 2016, we opened the established investigator MIRA mechanism to all NIGMS grantees whose single-PI R01-equivalent grants were set to terminate in the same or subsequent fiscal year as the MIRA application. The purpose of this post is to remind you of important points to keep in mind if you are eligible to apply for a MIRA. Before applying, we strongly encourage you to contact your program director, who can advise you on whether MIRA is the best funding program for you and can help estimate a project budget if your application does well in peer review. NIGMS is committed to ensuring that taxpayers get the best possible returns on their investments in fundamental biomedical research [PDF 702KB]. As part of this commitment to stewardship [PDF 7.89MB], we regularly monitor trends in our funding portfolio. We recognize the value of a diversified investment portfolio and approach our research investments in a similar fashion. Sustaining a broad and diverse portfolio of talented investigators is a central goal of the Institute, as a wide variety of research questions can be studied by an investigator pool that comprises many different backgrounds, fields, and skills. To monitor this, we track the “cumulative investigator rate,” which indicates the proportion of unique investigators actively seeking funding who had an NIGMS grant in a given Fiscal Year (FY). As shown in Figure 1, the number of investigators seeking support consistently increased between FY 2006 and 2014, but the number of NIGMS-funded investigators remained relatively unchanged over that same period. As a result, the cumulative investigator rate steadily decreased. Since FY 2014, the cumulative investigator rate has steadily increased, as the number of applicants seeking support has stabilized and the number of investigators receiving support has grown by 14%. Currently, 37.4% of investigators seeking R01/R35 funding from NIGMS received support in FY 2017. Figure 1. Number of NIGMS R01/R35 Applicants, Awardees, and Cumulative Investigator Rates, FY 2006-2017. The number of investigators actively seeking NIGMS R01 and R35 support (blue circles, dashed line; left axis) increased steadily from FY 2006 to 2014 but has stabilized more recently. These applicants were defined as anyone who submitted a competing NIGMS R01 or R35 application in the fiscal year shown or any of the previous four fiscal years. The NIGMS R01 and R35 awardee counts (green squares, solid line; left axis) remained relatively stable from FY 2006 to 2014 and have increased somewhat over the past three years. As a result, the NIGMS cumulative investigator rate (gray triangles, dotted line; right axis) declined from FY 2006 to 2014 but has begun to recover since then. Attention NI/ESI MIRA Recipients: This Webinar Is for You. UPDATE: The video and slides from the NI/ESI MIRA webinar have been posted. If you are a new investigator (NI) or an early stage investigator (ESI) who received a Maximizing Investigators’ Research Award (MIRA) in 2016 or 2017, you may be wondering how having a MIRA affects your ability to initiate collaborations or apply for other grants. Or, you may be curious how much flexibility you really have to deviate from your original research plans. You may also be thinking a few years ahead about a competing renewal application. Because MIRA is a new grant mechanism, NIGMS will host a webinar designed specifically to address these and other topics of interest to NI/ESI MIRA principal investigators (PIs). NIGMS program, grants management and review staff will be on hand to provide information and answer your questions. We invite NI/ESI MIRA PIs and their business officials to participate. The webinar (link no longer available) will be held on Tuesday, September 26, from 2:00 to 3:45 p.m. EDT. The site is compatible with mobile devices. Participants will be able to submit questions through the chat function. For an audio-only presentation, call 1-866-815-0443 and enter passcode 3268089. We will post the archived webinar and slides on the MIRA webpage after the event. Our Maximizing Investigators’ Research Award (MIRA) program is still relatively new, so it’s not surprising that NIGMS staff frequently hear misconceptions about it. This post dispels five common MIRA myths. Myth 1: Once an investigator is awarded a MIRA, the budget will never increase. MIRA budgets may increase. At the time of the competing renewal application, a principal investigator (PI) may request an increase in funding. MIRAs with modest budgets that have been very productive and score very well could receive budget increases. Study sections will be asked to look at budget requests, and NIGMS staff will make determinations based on the reviewers’ recommendations and available funds. Myth 2: Early stage investigators will receive more funding for their labs if they get an R01 than if they get a MIRA. A MIRA PI who is an early stage investigator (ESI) has a higher probability of receiving more NIGMS funding than a non-MIRA ESI. Most ESI MIRA investigators receive $250,000 in direct costs per year. A recent analysis found that the vast majority of ESIs who have received an NIGMS R01 are initially awarded $200,000 or less, and most do not go on to receive a second NIGMS R01 during the first five years of their initial award. Thus, the total NIGMS funding for most relatively new investigators is higher with a MIRA. Myth 3: MIRA discourages collaborative research. NIGMS strongly endorses collaborative research, and this extends to the MIRA program. However, the MIRA concept is based on the idea that NIGMS will provide support to individual investigators’ research programs. Collaborators are expected to work together because of their mutual interest in a problem. The collaborator, in most cases, will support his or her efforts with independent funding, not through a subcontract from the MIRA. In cases where a collaborator’s efforts are well-justified, essential to the research program of the MIRA and cannot be supported by the collaborator, a consortium agreement can be included in the competing application. NIGMS also encourages scientifically productive international collaborative research efforts. However, NIGMS will only provide funding for a foreign consortium arrangement when the collaboration is essential to the PI’s research program, represents a unique scientific opportunity and cannot be supported by the collaborator. Myth 4: MIRA PIs cannot apply for administrative supplements. MIRA PIs are eligible for Research Supplements to Promote Diversity in Health-Related Research and may be eligible for other types of administrative supplements, such as equipment supplements offered by NIGMS through notices in the NIH Guide for Grants and Contracts. In rare situations, NIGMS may provide a supplement for a piece of equipment that could not have been anticipated at the time the application was submitted. Myth 5: MIRA PIs cannot apply for NIGMS training grants or conference grants. MIRA PIs are eligible to apply for grants that support research resources, training, workforce development or diversity building, clinical trials, selected cooperative agreements, SBIR/STTRs, conference grants and the portion of a center grant or a P01 that is strictly a core. In addition, a MIRA PI may receive grants from other NIH institutes or centers, although when making funding decisions NIGMS always considers an investigator’s other support, as described on our Funding Policies page. More information, including answers to frequently asked questions, is on the MIRA page. UPDATE: The slides from the MIRA ESI Funding Opportunity webinar have been posted. To be eligible, you must have completed your terminal research degree (or medical residency) less than 10 years ago and must not have served as the principal investigator (PI) of a substantial NIH research award, e.g., an R01, P01, U01, SC1 or DP2. If you’ve served as the PI of one or more smaller awards, such as an R00, R03, R15, R21, SC2 or SC3, you retain your ESI status and can still apply to the ESI MIRA program. A complete list of the smaller grants and awards that do not affect ESI status is available on the Office of Extramural Research webpage. ESI status can be extended for qualifying reasons, including but not limited to family care responsibilities or active military service. Here’s a complete list of qualifying reasons. If you submitted a MIRA application in previous years and are still eligible for this FOA (i.e., retain ESI status), you’re welcome to apply but must submit a new application rather than a resubmission. A new application may still cover the same topics you proposed previously, but must not include any specific section explicitly designated as a response to reviewers. If offered a MIRA, you must devote at least 51% of your time available for research to the award; however, note that taking less than 51% salary for the PI is allowed and in no case should more than 51% be requested. Unlike previous rounds, you may have an NIGMS R01 application and a MIRA application under review at the same time. Should both applications score well enough to be considered for funding, you will be required to withdraw one or the other. Applications that don’t fall within NIGMS’ mission will be returned without review, so be sure to contact me or the program director whose scientific area is closest to yours to discuss your proposal while in the planning stages! These and many other topics related to the MIRA ESI FOA are covered in detail in a newly-released set of frequently asked questions. We’ll also be hosting a webinar to discuss the FOA (no longer available) and answer your specific questions about the program on Monday, July 10, from 1:30-2:30 p.m. EDT. The site is compatible with mobile devices. For an audio-only presentation, call 1-888-989-5313 and enter passcode 8866047. We plan to post the archived webinar and slides on the MIRA webpage after the event. One question that has been asked about the Maximizing Investigators’ Research Award (MIRA) for Early Stage Investigators is how awardees will be affected by the fact that they cannot have additional NIGMS research grants. In response to this question, we reviewed the research project grant (RPG) funding history of all 707 Principal Investigators (PIs) who received an NIGMS R01 as an Early Stage Investigator (ESI) between Fiscal Years 2009 and 2015. The PIs were grouped by Year of PI, which ranges from Year 1 to Year 5 (five years is the typical length of an ESI R01 award). Year 1 is the year in which the PI was awarded his or her initial R01, and Year 2-Year 5 represent the subsequent years. The awards and funding history of each PI were confined to Fiscal Years 2009-2015; thus, all PIs are included in the Year 1 group, while those who received their initial R01 in 2013, for example, would only appear in the Year 1-Year 3 groups. The distribution of NIGMS awards (including subprojects) for these PIs is depicted below. Figure 1. Percentage of Principal Investigators by Number of Active NIGMS Awards. Year 1 represents the year of the initial NIGMS R01; Year 2-Year 5 represent the subsequent years. Only Fiscal Years 2009-2015 are included. 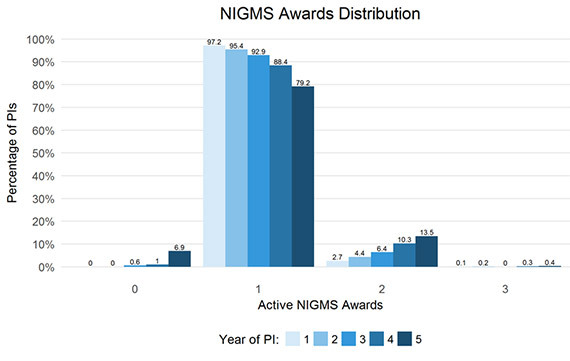 No PIs had more than three active NIGMS awards in a single year.